We simply do not have any promise from God that the departed saints hear us or take an interest in our lives. In fact, in the passages of Scripture that might speak to such a relationship, the opposite impression is given (e.g. Isaiah 63:15,16, where two of the chief saints of the Old Testament are described as not knowing or acknowledging the living people of God, as opposed to God himself, who does know and care; and Luke 16:22-31, where the formerly rich man in hell is described as worrying about his relatives still living on earth, while Abraham and Lazarus in heaven are not so described). The way Roman Catholics address the saints is simply not the same way we address fellow believers when we ask them to pray for us. When we ask fellow believers to pray for us, we are not looking to them for help, but asking them to join us in seeking help from God alone in Jesus’ name. (That Roman Catholics are actually looking to those saints for help is indicated, among other things, by the fact that many of the departed saints are labeled as “the patron saint of [music, travelers, lost causes, a certain country, etc. ].”) The Roman Catholics who pray to the saints often use their prayers to the saints as a substitute for calling on God, because they view the saints as more approachable than God (as Martin Luther viewed Mary when he was a monk). God invites, urges, and commands us to call on him in many places in Scripture, while there is not a single exhortation or command in Scripture to call on the departed saints. 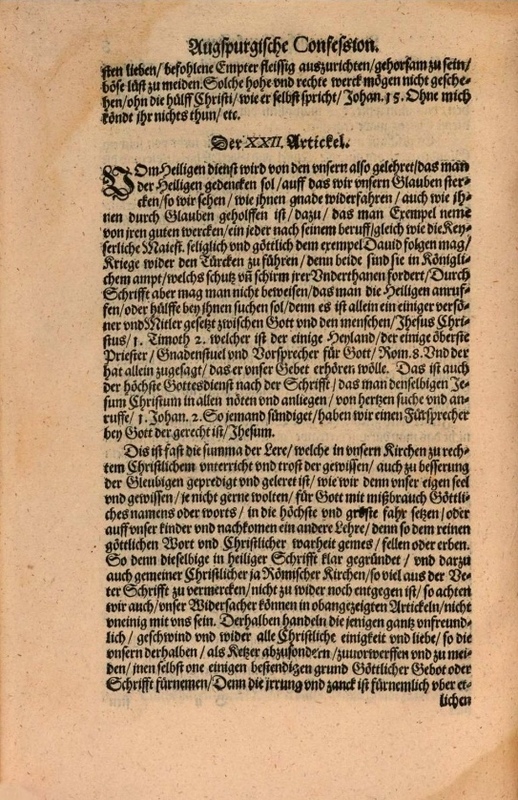 As Melanchthon brings out in the very next sentence, the Bible explicitly says there is only one mediator between God and humans – Jesus Christ. 3 “Mercy seat” (German: Gnadenstuhl) is one of the translations of the Hebrew word כפרת, also translated “propitiatory” or “atonement cover.” First mentioned in Exodus 25:17, it was an article of gold that sat atop the Ark of the Covenant (Ex 25:21) and covered over the tablets inscribed with the Ten Commandments. Thus the mercy seat stood between the Law of God and the presence of God himself, represented by the pillar of cloud that was situated as if enthroned on the mercy seat, above the Ark. Once a year, on the Day of Atonement (Yom Kippur), blood would be sprinkled on the front of and before the mercy seat by the high priest, thus atoning for the sins of the people (Leviticus 16). This was the imagery: As God looked down from the pillar of cloud upon his law which his people had continually and daily violated, instead of seeing his broken law, he would see the blood of a substitute on the mercy seat, more precious to him than the gold of the mercy seat itself, and thus his wrath would be appeased. Jesus is the ultimate mercy seat, since his blood actually atoned for all our sin once and for all (Hebrews 9:23-26; see also 1 Peter 1:18,19). 4 For proof passages in addition to those cited by Melanchthon, see e.g. Deuteronomy 32:7-9 (remembering the saints of old in a way that calls to mind God’s promises and their fulfillment); Psalm 50:14,15; Philippians 3:17 (following the godly example of the saints); Hebrews 13:7 (same); Revelation 19:10 (where an angel forbids John to worship him, calling himself “a fellow servant with [John]” and telling him to worship God alone).